$10 gets you a Pint and a "5-Minute Quick Build" pinewood derby car kit. ...or bring your own car (still need to register)! Must have 3/8” clearance under the car body. Maximum weight: 5.0 ounces. The official race scale used at check-in shall be considered final. 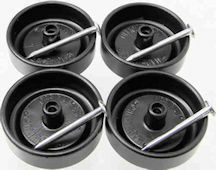 Stick-on weights are supplied in the kit, but you may use any weights. Axles are supplied in the kit, but you may use any axles. Wheels are supplied in the kit. Must use BSA wheels. You may remove imperfections, but may not substantially alter or drill the wheels. Quick Build 5-Minute car kit! Easily push axles into pre-drilled axle holes!